Once again I ate and i regret it. I always regret every time I eat in this food court outlet. They are one of the outlet in every shopping malls in Dubai that serves the so closed to Filipino taste, the chinese food. Usually i regret it when i didn't finished all the food because one serving, a combo meal cost around 25 aed or 300php. 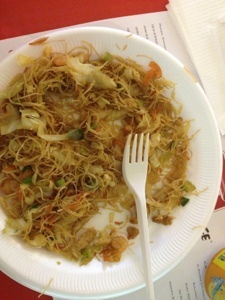 Today i eat this bihon that cost 13 aed, this time i didn't finished it because the taste is not good. It lacks of salt, soy sauce.